Do you want to perform magic on the pool table? Here's your chance to master a "trick shot" that's actually useful. In a massé shot, you hit the cue ball in a downward motion so that it takes a curved path or otherwise changes direction mid-flight. It can be an imperceptibly slight curve or a dramatic 180°. Poolroom and bar owners don't take too kindly to players attempting extreme massé shots because of potential damage to the felt from inept efforts at massive elevation and power. Have no fear, the massé shots that are controllable and easiest to incorporate into your game, also known as "swerve shots," are docile creatures drawn out by finesse and a gentle hand. You might be massé-ing and you don't even know it yet. 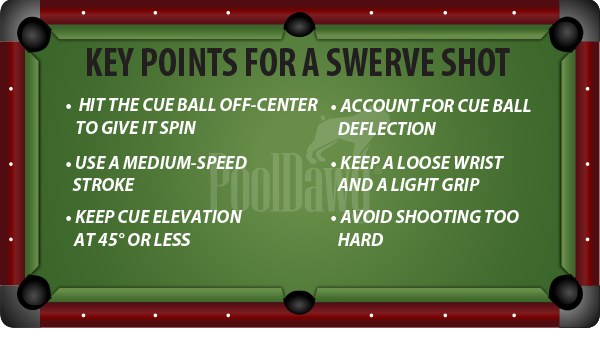 One of the primary pieces of pool advice is to keep your cue level while shooting. 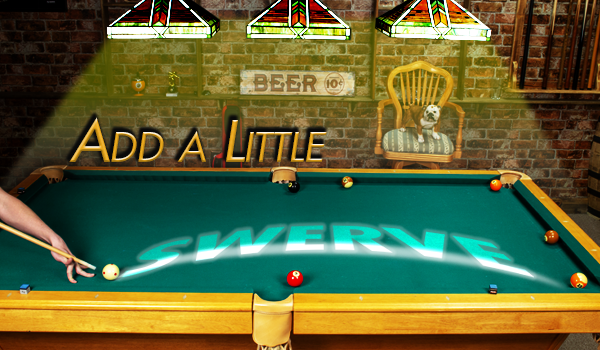 If you elevate your cue and hit off-center, your cue ball will curve a little and you'll miss your shot. Well folks, that's called an unintentional massé! How do Massé Shots Work Anyways? By elevating the cue and hitting down on the side of the cue ball, the cue ball starts out headed one direction with a downward spin that's fighting to take it in the opposite direction. The fight goes something like this: the ball goes one way because of the direction of the hit until it slows down enough for the spin to grab and take it back the other way. To make the ball curve to the right, hit down on the right side of the cue ball - or left to go left. Frank Says: "Worried about tearing up your cloth while attempting massé shots? Stefano Pelinga's Cloth Shields are made to protect your table from skids, spots, and burn marks – so you can practice these shots worry-free!" What good is a massé shot except to make me look fancy? A massé is useful as a way to go around a ball that's in the way of your shot. To aim, you'll need to imagine the curved path first and aim to one side of the obstruction in order to avoid hitting it. The spin will carry the ball back. Deflection is your friend. Finally! Because you're hitting the cue ball off-center to give it some spin, it's going to get pushed off the line of aim. For example, if you hit down on the right side of the ball, it's going to shoot off to the left a little. You won't need to aim as far to the side of your obstacle because the deflection will be helping push you in that direction. 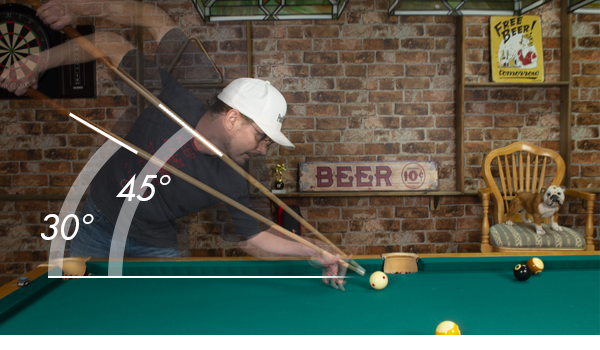 Don't overdo the elevation of your pool cue or the speed of your stroke. Massé shots can require up to 90 degrees of elevation, but you can still get plenty of spin and be more accurate with "swerve shots" by keeping your stick angle 45 degrees and under. The two biggest mistakes that massé newbies make are trying to elevate too much and hitting the shot too hard. Restrict yourself to 45 degrees of elevation or fewer as you're learning to massé. A smooth, medium-speed stroke with a very loose wrist is what's required to achieve the best results. Hitting the shot too hard will cause the cue ball to deflect wildly, causing the cue ball to go too far off to the side. A hard hit also will mean the cue ball will be traveling too fast for the spin to grab in time. Combining three variables for massé shots isn't easy! The things that make a massé work – proper elevation, side offset from center ball, and speed of stroke – all interact with each other. Ultimately, it's a matter of experimenting to get a sense of feel for the proper combination. Start small. A very small elevation and very small amount of spin will allow you to get around the edge of a ball that's only slightly in your way. Gradually work your way around bigger and bigger obstructions until you can clear an entire ball. Editor Note: Want to see some of these moves in action? Check out Liz Ford performing some English and massé shots for the TV show Time Warp on Discovery Channel!